Did You Know These 6 Waste And Recycling Facts? Home > News > Did You Know These 6 Waste And Recycling Facts? It’s pretty well known that the U.S. could do better with its current recycling rate, which is just 34.5 percent. Recycling seems easy enough, but it’s often a complicated and misunderstood issue that people can’t agree on. Most of the glass, plastic, paper and metal that ends up in the trash can be recycled, but in the landfill it’s just a lost resource. Learning more about waste and recycling can make a huge difference in the future of our environment. Increasing our recycling rate to 75 percent could create 1.5 million permanent jobs. Producing items from recycled materials can reduce costs and pollution as well. However, some would argue that recycling isn’t the most cost-efficient option to deal with waste. For example, in New York City it costs $300 more to recycle 1 ton of material than does to send it to the landfill. 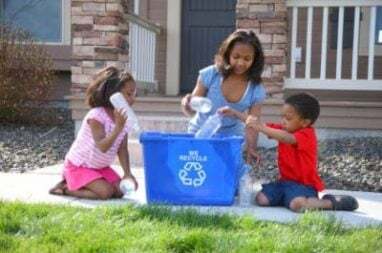 Regardless, promoting recycling and spreading facts about waste is important, since it can motivate people to consume fewer wasteful products in the first place. Processing virgin materials, rather than recycled materials, consumes a lot of energy. Take aluminum for example: Producing cans from recycled aluminum requires 95 percent less energy than creating them from new aluminum. Recycling just one aluminum can also saves enough energy to watch 3 hours of TV or listen to an entire album on your iPod. Buying items made from recycled materials, especially metal, can help the environment even more. Many stainless steel bottle makers use virgin materials, which is extremely resource-intensive compared to bottles made from recycled steel that is widely available. Glass can be recycled and remanufactured indefinitely without losing its quality or wearing out. Steel, aluminum, copper and other metals are also endlessly recyclable. Paper can be recycled 5 to 7 times before its fibers become too short. Plastic can generally only be recycled once, but it’s so versatile when recycled that it can be made into everything from fleece jackets to carpeting. 35 million tons of food waste is disposed each year in the U.S. and about 95 percent of that is sent to the landfill or incinerated. In the landfill, decomposing food creates methane gas, which is one of the more potent greenhouse gasses contributing to climate change. A good way to reduce your impact is by buying less food in the first place, and donating what you don’t use or composting what you can’t use. More than 11 million tons of recyclable textiles go to the landfill each year, which equates to roughly 70 billion t-shirts. Most people will donate clothing that they no longer need, which is a great way to keep it out of the waste stream. However, donating clothing can take time and some clothes are too worn to donate anyway. Rather than throwing them in the trash, consider dropping them in a textile drop box such as the ones at certain H&M stores or the USAgain boxes available throughout many towns. When you think of the most commonly recycled items, you might think of glass bottles or soda cans, but vehicles are actually the most-recycled item in the world. In the U.S. and Canada, the automobile recycling industry provides enough steel each year to produce 13 million new vehicles. Like all of the other waste-reduction methods above, you can get involved in vehicle recycling. All you need to do is donate an unwanted car, truck, boat, RV or motorcycle to Wheels For Wishes. We can accept most vehicles and auction or recycle them to benefit local Make-A-Wish chapters. In addition to helping your local Make-A-Wish grant more wishes, your donation will also give you a great tax deduction and free vehicle towing. Call us at 1-877-431-9474 or complete an online car donation form to donate your vehicle today!